A Classic Tree of Life pattern with a twist. In collaboration with Celerie Kemble, the dramatically scaled print combines stylized exotic motifs with an au courant palette. Featured as a decorative accent, this is sure to fashionably enhance and enliven any interior or setting! Since Schumacher was founded in 1889, our family-owned company has been synonymous with style, taste, and innovation. A passion for luxury and an unwavering commitment to beauty are woven into everything we do. Pillows & Accessories Product Detail Pattern name: Hothouse flowers Color: Mineral Fully wrapped (pattern on both sides) Down/Fill Insert included Zipper Closure Self-Welt edge Content: 100% linen Measures 18". *Sold as an individual item. 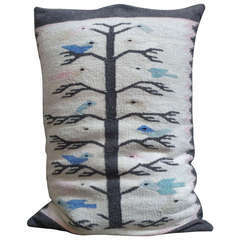 Beautiful linen sea life pillow embroidered in India. This is one in a series of additional pillows which all have a sea theme (Photo). 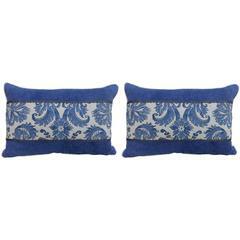 Pair of blue & white Vivaldi patterned Fortuny textile & linen pillows with antique cream home spun linen backs, antique metallic gimp and self cording. Down inserts.